We have over 70 members now, not all need moorings in the harbour, in fact 37 moorings have been allocated to date. The boats will be back in the water on the 9th and 10th April “Where they look best”. However you may have noticed Good Fortune has been in for some weeks earning a living. We have plans to bring you articles of interest in the future, so look out for HARBOUR NEWS next time. STOP PRESS...... Good News. 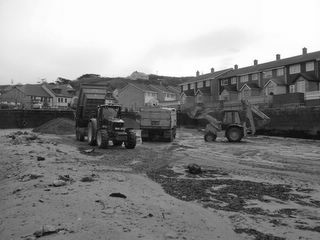 Kerrier D Council have organised sand removal from the harbour. This is planned to be carried out by week ending 8th April. The purpose to reduce seaweed build up and the associated smell in this part of the village, and help navigation within the harbour. 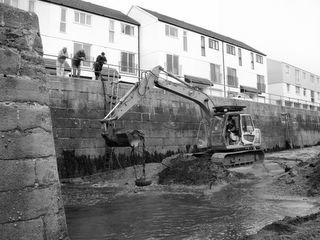 The harbour association thanks Kerrier D Council , Portreath Improvements Committee for helping us to fund this much needed job. highway, particularly in the vicinity of the School. possible danger to walkers and cyclists using the Mineral Tramway. Lane is being investigated by the County Council. will not be opened for the time being. authorised to carry out the unlocking of the toilets in the mornings. toilets should be available during this time. maintenance of the Gardens are proceeding. District Council commencing in early April. include landing of Marines from ships anchored in the bay. during the week prior to the Easter period. dangers in using this section of Glenfeadon Terrace as a play area. pressure will ensure that the work will be carried out shortly. vigilant and immediately report any suspicious activity. as far as I know it. when the PIC took the site over. a 3-meter square platform, considerably lower than existing levels. no garden left to restore. for his integrity in business matters. Church, along with a carved chair in memory of his late wife Hilary. from the turn of the century to the 1950's. BROTHERS, CRAIG AND LIAM SMITH WIN FIRST EVER BARN TOURNAMENT. battle it out on the badminton court. The final was between 4 boys - Jack and Justin against Craig and Liam. tournament at the Barn Youth Club. ends in April so if you are interested, phone Terry 843181.
either been broken into and had items removed or have been damaged. vehicle is locked and has no valuables left in it when you park up. that a thief would find desirable. not know that he has broken into such a vehicle until it is too late! We will put a clear announcement in the Tram beforehand. Meanwhile, don't hesitate to pick up any litter you see lying around!!! including a trip to Trebah, a Cream Tea and an information session. company that are carrying out the work. of which was to donate funds to the tsunami appeal. the club members thanking the PIC. administration of the car park. The PIC voted to donate match funding for the dredging of the harbour. soils whereas three-cornered leek seems to flourish on enriched soils. maintenance before committing to a lease. by his family, and all who knew him in his various walks of life. Stores and when the store closed he became an apprentice carpenter. Perkins and Perry fitting roof trusses. aid of the Millennium Hall in Portreath. the total to date is £520. will send attachments and a few bits and pieces tomorrow. limited space in the paper, here are just some of those comments. "We are having such fun on Tuesday evenings"
fitness as it is best to avoid falling on the floor !" 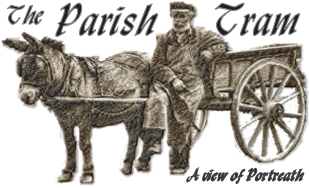 great fun – come and join"
fun and there are lots of nice people"
Portreath Badminton Club is the best thing that has happened to me"
fees include the use of the fully equipped kitchen.